According to the Smithsonian, the oldest tattoo on a human belongs to the Iceman discovered in the Italian-Austrian border back in 1991. He was carbon-dated at around 5,200 years old. Now that's a lasting tattoo. Iceman was sporting tattooed dots and small crosses on his lower spine and right knee and ankle joints. Because these locations correspond to areas of strain-induced degeneration (their words not mine), suggested they many have been applied to alleviate joint pain, so basically they were probably therapeutic. Jump ahead about 1000 years and we find Egyptian women sporting tattoos. All through history tattoos have been a part of many cultures. Some cultures used tattoos as a sign of nobility and others used them as a sign of ownership of a religious sect or to another owner. Some cultures such as those of Polynesia use elaborate tattoos that have been developed over millennia. These feature geometric designs sometimes covering the entire body. Captain James Cook encountered such cultures on his 1769 British expedition to Tahiti. The islanders referred to the designs as "tatatau" or Tattau" which meant hit or strike....hence the birth of the modern term tattoo. Today, tattoos are still important parts of many cultures around the world. They've also become popular ways for many modern-day individuals to express themselves. From inspirational phrases to illustrations of family members, tattoos usually carry great meaning for the person sporting the tattoo. This is no less true in the running community. From the Ironman logo to the iconic 26.2 image, you'll find many runners with running related artwork on their torso, calf, thigh or arm. Like anything, some people hate tattoos, some love them and sport many, while others are indifferent to them. I've been pondering a running related tattoo for several years. I think it's time for RunnerDude to take the plunge. The RunnerDude motto is "Trust. Believe. Conquer!" I'd love to somehow incorporate the motto into a tattoo. I'm thinking the location would be the back/center of a calf. Nothing too big, but big enough to be seen and possibly motivate. I'd love to see your ideas for a "Trust. Believe. Conquer!" RunnerDude tattoo. 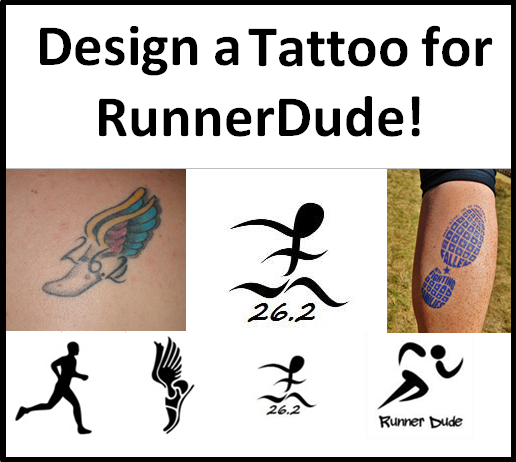 Sketch your ideas and email a picture to runnerdudeblog@yahoo.com by July 4th. I'll post all that are sent and I'll let the readers vote on their favorite. I'm excited to see your ideas! Participation from the running community will be fun. The winning design may not be exactly what I end up using as the final tatoo, but the entries will be great inspiration for the final product and of course good references when meeting with the tattoo artist. TIMEX Ironman Easy Trainer GPS Giveaway!